A direct descendant of Crazy Horse, the Indian Sioux warrior, Joan Shaw (Salena`s birth name) was born in Newport News, Virginia, and began singing in church and school before making her debut on life's bigger stages. As a very young girl, Joan Shaw`s career began in New York at Manhattan clubs and going on to Harlem`s Apollo Theatre, when she won the amateur night singing "September Song". Joan grew up in New York in the company of musicians who would become the legends: Miles Davis, Charlie Parker, Dizzie Gillespie, Bud Powell, Wes Montgomery, Chico Hamilton and Stan Getz - she met all these people, jamming with some of them, and began making demonstration records for artists like Peggy Lee, Brenda Lee and Lena Horne, before getting her own recording contract. Based in New York, with her own "Blues Express Orchestra", Joan toured widely across the US with "King" Curtis in her band (whom she named), also working with Johnnie Ray, Laverne Baker, Arthur Prysock, and Frankie Lyman. This rhythm`n`blues period was the forerunner to rock`n`roll and it is evident that Joan Shaw is revered today by afficionados of that important era, making 15 singles by the time she was fifteen years old (the first being released at the age of eleven) – many can be heard today through You Tube by the wonder of the Internet). Joan then worked regularly at the famous venues of the Village Vanguard, Minton`s Playhouse and Wells Supper Club. Leonard Feather, the noted jazz critic for "Downbeat" magazine, named Joan Shaw as one of his choices as "most promising newcomers", together with "Peggy Lee, Ella Fitzgerald and Mel Torme". Glamorous and beautiful, with her distinctive voice and relaxed style, by then she had met and sung with a breathtaking array of great jazz names. Her photo album shows her arm in arm with everyone from Betty Carter to Cab Calloway, Billy Eckstine, Vic Damone and Lena Horne. However, wanting to expand her horizons, and concerned at the racism in her native country, Joan Shaw bought a one way ticket to Madrid where, having sung one song at the "Whiskey and Jazz Club", on the same night as her arrival in Spain, she was immediately engaged to sing nightly with Dexter Gordon. But London called, and arriving in 1965, her management recommended a name-change: and Salena Jones was born! She was soon booked to appear for the first time at Ronnie Scott`s for two weeks but, such was the audience reaction that she was held over for another week, and then another: eventually appearing for seven consecutive weeks – still a record after all this time for one of the most famous clubs in the world. Salena opened her own jazz club in London in 2001. Over the last five decades, Salena Jones has been a central figure on the British jazz scene and from her base here she has conquered the world. Salena has played everywhere, from Canada, throughout Europe, South Africa, South America, to the US and Asia, where she is a well-loved artiste (and has appeared in Japan at least annually since 1978). Salena has sung with Louis Armstrong, Hank Jones, Ray Brown, Sarah Vaughan, Maynard Ferguson, Mark Murphy, Lionel Hampton, Kenny Burrell, Dudley Moore, Roy Budd, and Toots Thielemans, Tom Jones, Antonio Carlos Jobim, the BBC Big Band and the Royal Philharmonic Orchestra. Salena’s recording career has reflected her ability to choose both varied repertoire and also to move beyond jazz boundaries. 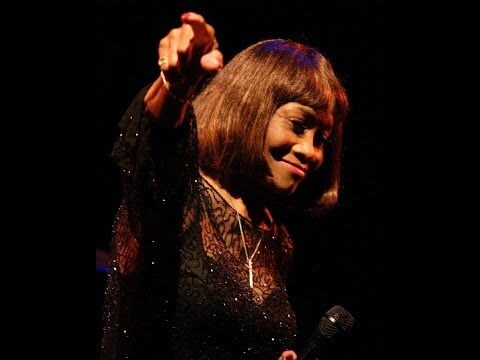 She has made 43 solo albums and 22 singles over a period of 50 years in the business. She was soon booked to appear for the first time at Ronnie Scott`s for two weeks but, such was the audience reaction that she was held over for another week, and then another: eventually appearing for seven consecutive weeks – still a record after all this time for one of the most famous clubs in the world. Salena opened her own jazz club in London in 2001. Over the last five decades, Salena Jones has been a central figure on the British jazz scene and from her base here she has conquered the world. Salena has played everywhere, from Canada, throughout Europe, South Africa, South America, to the US and Asia, where she is a well-loved artiste (and has appeared in Japan at least annually since 1978). Tell us what you think of SUNDAY JAZZ LUNCH: Salena Jones below..